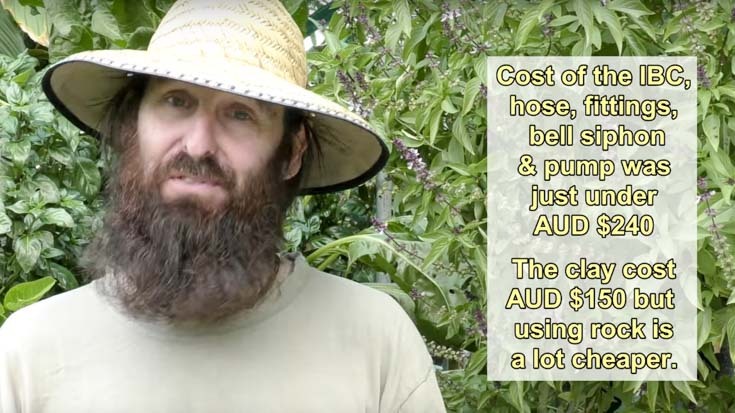 Download this free PDF guide for building your own IBC Tote, backyard aquaponics system. It's basically the same information that is in this blog post, but organised so that you can print it out. Enjoy! 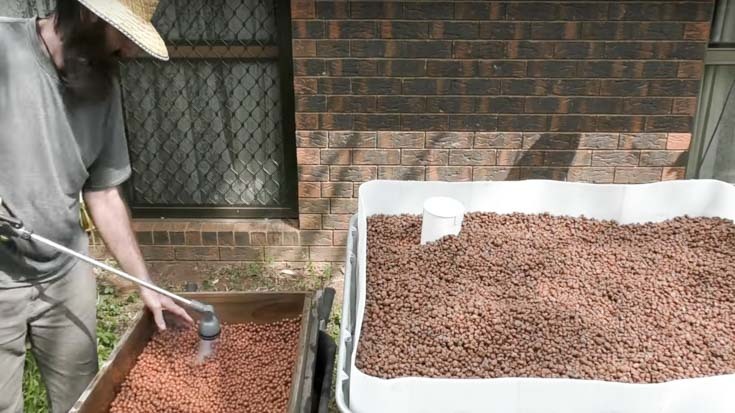 Follow this guide to build your own IBC Tote aquaponics. I will update this post later with information on how to construct the bell siphon. Hope this infographic helps you to get started in your journey to healthy, organic and fresh produce for your family. A big shout out to Rob Bob, please go check out his youtube channel. The information here is from his videos. 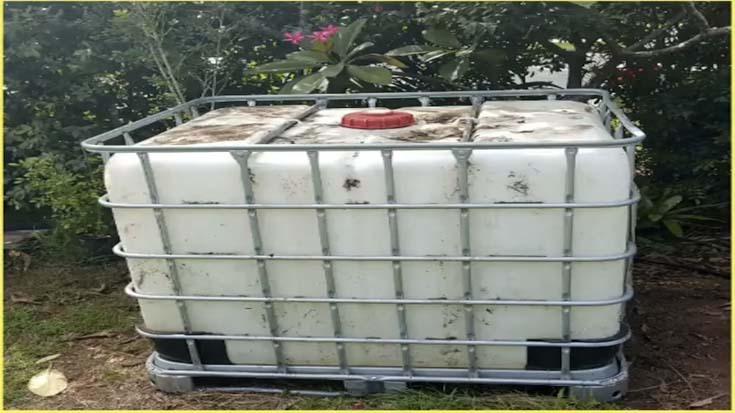 To create an Aquaponic system, you will need an IBC (intermediate bulk container) with the capacity of at least 158 gallons. It is essential to rinse the entire container thoroughly, due to the possibility of foreign chemicals being present. 1. Taking out the IBC: To remove the IBC from its cage, you will need a Phillips head screwdriver, or a screw gun and t-40 and t-30 drill bits. First, remove the top bars holding the container in and save them for later. Remove IBC from cage. 2. Cutting the Fish Tank and Growth Bed: Cut the IBC approximately 1 foot down from the top, or right below the 20-gallon mark in the tank. Mark this spot all around the container using a marker and straight edge. Cut lines evenly with a hacksaw or reciprocating saw, removing the top of the IBC. Save the part you just cut off for later, as the part you cut off will be the growth bed. Tip: Clean up edges with a razor blade. 3. Altering the Cage and Pallet: Using a screwdriver, take off the screws attaching the cage to the pallet. You will also need to remove the legs of the pallet. Next, remove the valve cover, this can be done with pliers. 4. Cutting the Cage: Before cutting the cage, remove the black corner pieces by dislodging them with slight force. Next, start cutting the top two rungs of the cage off with your hacksaw or reciprocating saw. There will be a clear opening for the fish tank; however, you need to cut both rungs on either side in order to widen the opening. Set aside the top part, because it will become the cage for the growth bed. Tip: Always wear protective gear when using the saw, and sand down any sharp metal edges. Cover metal edges with sealant. 5. Assembly Prep: Fill any gaps in the pressure release valve (located on the bottom of the growth bed) with an aquarium grade sealant. This will stop any leaks from the valve. 6. Fish Tank Assembly: Place the pallet without legs on the ground, and then place your new fish tank on top of it. Dig a small hole under the valve opening in order to assure a flat surface and proper drainage in case of a leak. Tip: A level surface underneath your whole tank is very important. Next, place the cage back over the fish tank. It will fit snugly without screws. Reattach the valve cover with zip ties. 7. Growth Bed and System Assembly: Put two pieces of hardwood on top of the fish tank structure. They should be longer than the cage itself. Place the growth bed cage on top of that. The growth bed should sit approximately 1 foot back from the opening of the fish tank to ensure an easy reach into the tank. Screw the two top bars from the cage back in the openings you will find in the growth bed cage. This will be the support for the growth bed. The growth bed container can now go into its cage. You are half way done, congratulations! 8. Pump Assembly: You will need a 793gal/hr magnetic drive water pump. This will send fish tank water into the growth bed. -First, attach the adapter to the open end of the pump. -Before attaching the pipe (length varies according to your system), let the openings sit in hot water for 15 seconds. This makes it easier to screw on your water valve, and attach the other side of the pipe to the adapter on the pump. -Place the pump into the fish tank, with the valve attached to aerate the water. Attach the pipe to the IBC cage with zip ties, connecting all the way up to the growth tank, where your other valve will be. -Attach an elbow fitted pipe to your valve in order to direct the water into the growth bed. Bell Siphon System: A bell siphon system is composed of 3 main pieces. The shroud, which filters the water going to the siphon by keeping out debris and clay/rock, the bell, which has a chamber that fills with that filtered water, and the standpipe that forces the air out of the bell and drives the entire bell siphon cycle. All together this system saturates the growth bed and returns excess water to the fish tank below. The shroud encases the standpipe, which is attached to the bell. -First, you need to cut the slits into a 4-inch storm water pipe. Starting ¾-inch from the bottom to allow room for the drain cap, cut 9 slits ¼-inch away from each other with a drop saw. Complete 3 rows of 9 slits, and 3 rows of 4 slits above those. -The next step is the drain holes in the bottom of the shroud. You do not want these holes to be any larger than your smallest piece of rock/clay in your growth bed. Attach the bottom cap with two screws to ensure the cap stays in place, and then drill holes all around the pipe and cap.. You can see the drain holes in the photo above. -The last step of the shroud is the top cap, which needs to remain loose enough to remove easily. The main purpose is to keep out any debris such as plant matter, bugs, etc. Cut two 1 ½-inch pieces out of the cap sides with a saw, this will ensure it remains loose. -This is a simple process that only requires pieces that can be bought at any hardware store to be put together. First, attach a 5/6-inch reducer onto a ¾-inch pipe. This reducer lets in a large volume of water. -Next, the pipe connects to a ¾-inch adapter bush, which allows the pipe and its attachments to connect into a 5/6-inch valve socket. -After that, connect the pipe to the 5/6-inch bulkhead fitting by attaching the valve socket to the fitting. The standpipe is then connected to an elbow pipe, which will direct the flow of water, by a 1 ¾-1-inch uniseal. Securing it with an extra screw is recommended, to make it completely watertight. You will see the elbow pipe directing water on the right in the picture below. The valve on the left is connected to the pump you installed earlier. Great job, by the way! -Using a ruler, measure the length of your standpipe, and add 2 inches to it. This will be the length you have to cut your 2 ½-inch pipe that will create your bell. by making sure the pipe and cap is free of any grease or dirt, and then evenly applying a coat of glue to both surfaces. Shut the cap tightly and hold for 15 seconds to ensure a watertight seal. -On the bottom of your bell pipe, you are going to make cuts similar to the top cap of your shroud. Cut out 3 pieces of the pipe, each approximately a ½-inch into the pipe. This controls the amount of water that is kept in the bottom of your growth bed. If the cut is too little there growth bed will not be fully saturated, if the cut is too deep there will be too much water in your growth bed. The bell is now ready to fit over your standpipe and shroud. -Mark your desired location and drill a 1 ¼-inch hole for the bulkhead piece, which will allow water to flow into your fish tank. It should not be close to the edge of the bed. -In this order, place a washer and end cap on top of your drilled hole. Then, place your bulkhead through the whole and secure it with a washer underneath. Tighten the nut underneath with a set of pliers. -After this, screw a 90-degree elbow pipe onto your base underneath. Adding another pipe to this will create a pipe system that directs the water flow into the aquarium. Any slight leaks are okay. 13. Growth Bed Material: Whether you use clay or rock, it is important to rinse off your material before placing them in your growth bed. This avoids any extra dirt and dust clouding up the water of your fish tank and possibly clogging your pump and/or siphon system. It is important to know where your rock came from, and if they are safe for your plants and fish. 14. Final Touches on Fish Tank and Growth Bed: Now it is time to fill your fish tank with water. To ensure proper aeration and flow of water, open the valve in the fish tank approximately 1/3 of the way. This size fish tank will hold approximately 10-12 fish at the most. The valve in your growth bed will need some fine-tuning to find the right pressure for your plants and fish tank. You can now plant the plants of your choosing in the grow bed. Being mindful of the way the sun is hitting your plants and fish is essential. Tip: While it is not mandatory, covering your aquaponic system with paint, wood, or foil material will shield it from the light, and in turn control the level of algae in your system. Click here for Rob Bob's youtube channel.